For downtown Ithaca visitors who are looking for vintage, antiques, or the perfect eye-catching item – look no further than The Vintage Industry. To see who is behind the hand chosen and curated items that fill the store, you need to meet the Manager, Marie Sirakos. Marie is a Pittsburgh, PA native and came to Ithaca with her friends and family. 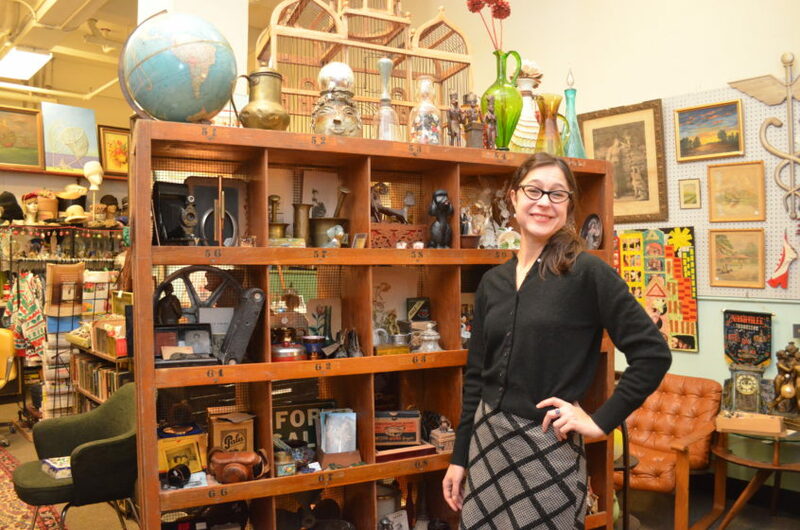 She has been the manager of The Vintage Industry for 6 years, but her love of antiques started long before that. Marie has enjoyed buying and selling antiques since she was nine years old. Influenced by her mother’s hobbyist antiques business, she gets a great deal of satisfaction from finding good homes for the items she collects. “Everything has a story. That’s what makes this business so fascinating,” Marie says. 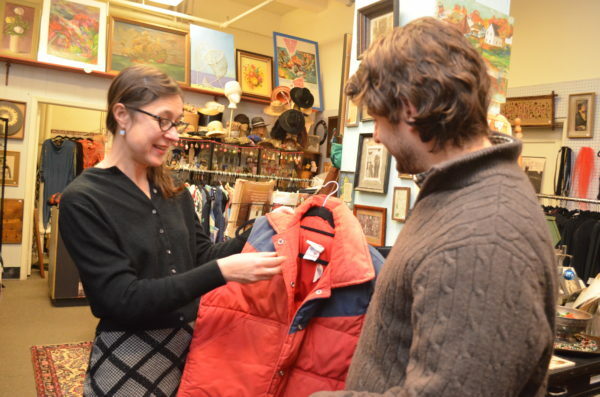 Marie shows a vintage piece of clothing to a customer at The Vintage Industry. Marie loves being able to treat customers to a unique experience. “Every item in my shop is hand chosen and curated vintage, antiques, fashion, and home decor. You will find items at The Vintage Industry that you would have never expected to find. And many items that you won’t find anywhere else.” They have a wide variety in an array of price ranges, from bargains to high-end pieces that are waiting to be found. One of the things Marie enjoys most about her business is that she is right in the middle of the downtown community and she is able to decorate her window for the people of Ithaca to see. “I love creating beautiful and creative window displays,” says Marie. Her window displays are full of unique vintage items that certainly will catch your eye. One of the best ways to check out what is in the store is at one of her many events, such as her Vintage Late Night that always draws a crowd of excited customers. Marie chose to be in Ithaca to grow her antiques and vintage business, and to be a part of the thriving downtown landscape. Also, as she mentioned as one of her favorite things, she couldn’t pass up the unique opportunity to have her business in the State Theatre building. “I enjoy being a part of the heart of Downtown Ithaca and I love being a part of the historic State Theatre building,” Marie says. When Marie isn’t curating vintage items or inside running the store, she is a theatre artist and a playwright. She urges that if you haven’t visited the store before to not be shy and come visit. Whatever you are looking for, Marie is excited to help you find that perfect item. To learn more about Marie and The Vintage Industry, visit the store at 113 W State St.